Outlook users rejoice, as Microsoft has just released a new update for both the Android and iOS platforms. Although it doesn't add too many new features, it's worth noting that all the changes included are meant to improve the way users manage contacts. First off, the update brings the ability to add and edit contacts directly from Outlook on iOS. Android users will get this feature as well, but it hasn't been included in this update. Furthermore, the contact card has been completely redesigned to offer users more details, including the newest conversations and shared files. 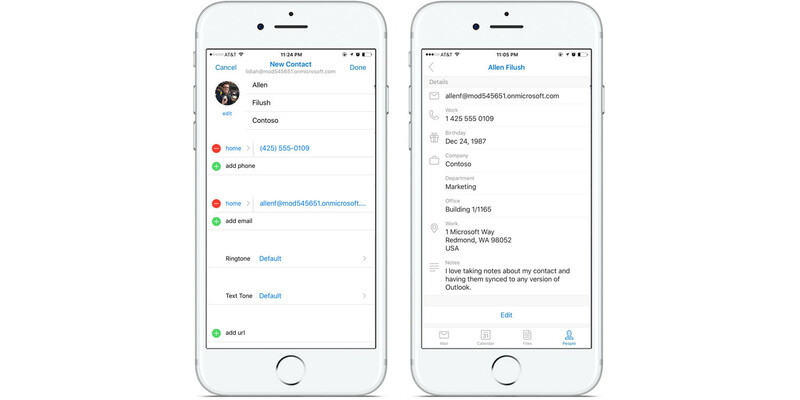 In order to create a new contact in Outlook, iOS users must head to the People tab and tap the + sign. Alternatively, iOS users can add a new contact directly from a message or event by tapping the name of a person and then using the Add Contact option. Another possibility would to simply use the search bar in the People tab to find and add contacts from the company directory. The new contact card should now provide users with more details at a glance. Whenever you tap on any name in the messages or events, you'll be able to access phone numbers, email addresses, along with other details such as Skype IDs and contact's pictures. Moreover, the new contact card now shows your most recent conversations, shared attachments and all the meetings that you have been scheduled with that person. Last but not least, Android and iOS users will now be able to save contacts to the default Contacts app so that they can see the name of a contact when they receive a call or text message much easier, as well as view all the contact's info directly in the Contacts app. 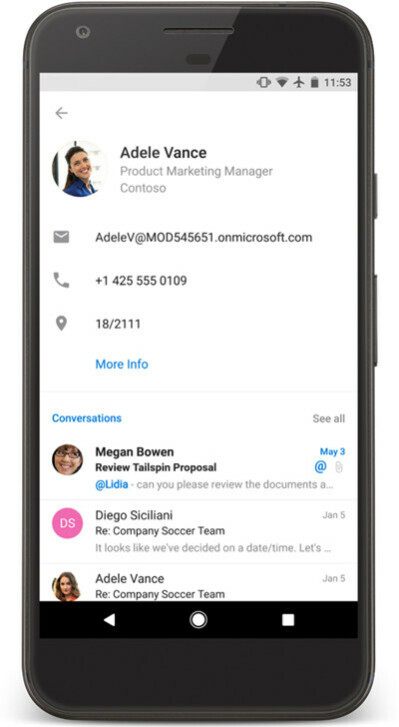 Keep in mind that all new contacts and changes made in Outlook will sync with the built-in Contacts app. Still, edits made in the contacts app will never sync to Outlook or an email service. It's also worth mentioning that enabling the Caller ID feature with the Outlook contacts can be done within Settings menu from the Save Contacts tab. Tfw when their Android (and I'd assume iOS) Outlook client is lightyears better and works more reliably with their own Outlook service than their own UWP app...... ie. it's not the mobile versions that could do with some serious attention. Ooh I'm super excited for this!